According to a survey, more than three out of 10 say it's OK for drivers to check email, text or be on social media while behind the wheel. And because it’s National Distracted Driving Awareness Month, AAA wants you to expand your vocabulary (and be safe). You might think almost everyone believes it’s a bad idea to email, text or check on social media while driving. But a AAA survey finds more than three out of 10 people are OK with it: Only 67% of D.C. residents responded that it’s never OK for drivers to engage in those distracting behaviors while behind the wheel. “Distracted driving — especially texting while driving — is just as dangerous as drinking and driving,” said John B. Townsend II, AAA Mid-Atlantic’s manager of public and government affairs. “Behind the wheel, this can become a deadly weapon,” Townsend said while holding up a cellphone. 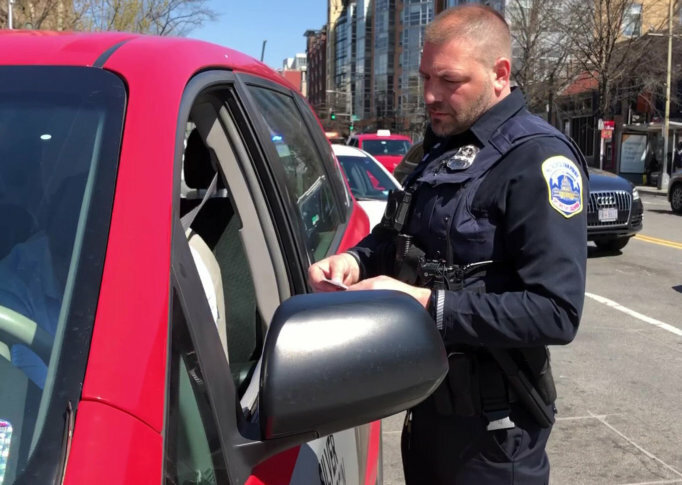 D.C. police conducted an aggressive enforcement effort immediately after a Wednesday news conference announcing the “Don’t Drive Intoxicated – Don’t Drive Intexicated” campaign. At times, there were up to three or four vehicles pulled over with officers on the blocks around 14th and U streets in Northwest D.C.
Officers handing out citations or having a talk with drivers might help save the lives of motorists, cyclists and pedestrians, said D.C. police Assistant Chief Jeffery Carroll. “Maybe you don’t get a ticket, but we need to have the conversation to let you know that what you’re doing is very dangerous, and it could really have an impact on someone’s life or kill them,” Carroll said. Drivers can view all the AAA distracted driving survey results by state here and can take the pledge not to drive distracted on AAA’s website.